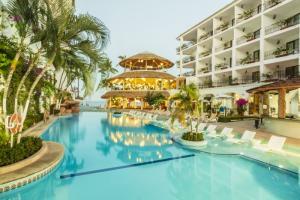 Playa Los Arcos Hotel Beach Resort & Spa is a charming colonial boutique style hotel that invites you to enjoy the vacation of your dreams. This beachfront hotel is ideal for families, friends and couples; for weddings or simply a beach escape. The quality of its facilities, hospitality and tradition of excellence in service will make your stay a truly pleasurable experience. Agabe, Mi Pueblito Restaurant, Maximilian, Tlaloc Palapa Bar, and In-Room Dining.